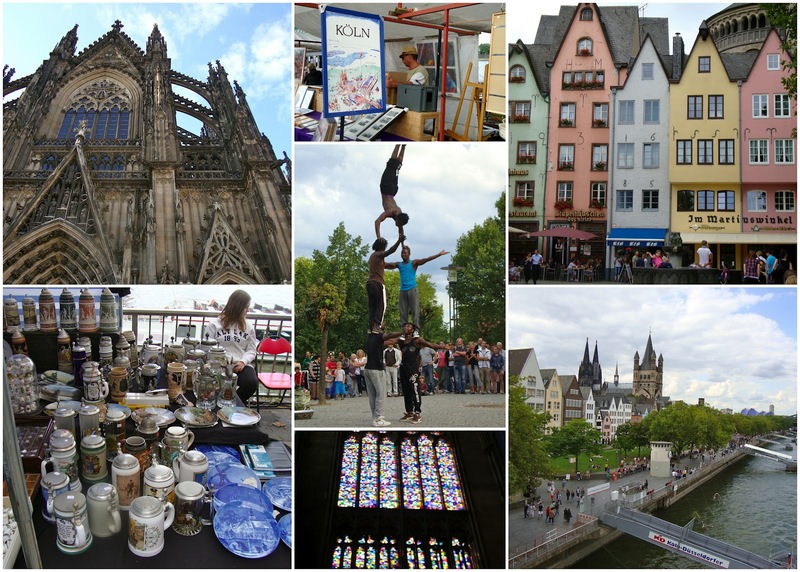 Today marks the end of the third part of our Germany trip, during which we stayed in Cologne. 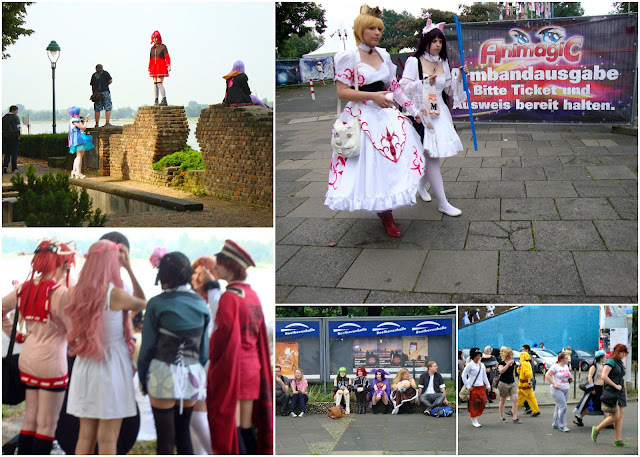 Tomorrow we'll drive to our final destination of Düsseldorf, where I'll stay until I leave on Wednesday. The sister and grandma will fly back to the states early Thursday morning. Today we packed up and left Baden-Baden, making a stop at the parents' house of grandma's pen pal. She met the German girl 19 years ago when the girl was 15 years old. After chatting with the woman's father for a bit we drove to Dahn, the town where my grandma's brother served in the early 60's. Then it was many more hours of driving (plus stops) until we reached Cologne. Highs: Not puking when I got carsick on the way to Dahn, Grandma eating the paper on her health hazelnut candy bar because she thinks it's edible (I'm still not convinced...), dinner for three costing 8.70 euros in a tiny German town along the highway, the sister accepting a full-time teaching position for the upcoming school year. Lows: Missing the views during what grandma called "the prettiest drive all trip" (to Dahn) due to closing my eyes in attempt not to puke, a closed highway adding over an hour and a half to our travel time on curvy back roads and Charlene (our GPS woman) being of little help. We drove from Cologne to Bonn, the capital of West Germany from 1949 to 1990. Highs: Seeing the viola Beethoven played and some of his hand-written compositions in Beethovenhaus (where he was born), eating crepes, our day's visit overlapping with an anime convention (aka anime fans providing our eyes with elaborate costumes to look at). Lows: The sister slipping on and falling in fresh puke on the stairs in a parking garage. 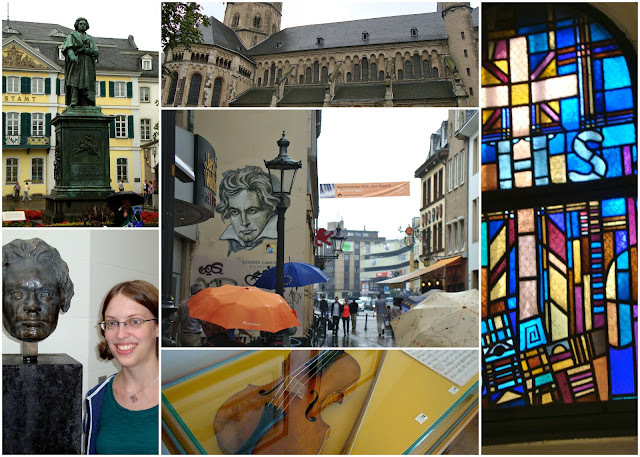 We spent the day exploring Cologne, since it's our last full day here. Highs: Seeing Germany's most-visited landmark: The Cologne Cathedral (Kölner Dom), the sister keeping the rain away by finally buying a new umbrella today (after leaving hers on the bus in Königsbrunn last week), having the whole upstairs to ourselves at lunch, finding and purchasing some neat rubber stamps at the flea market alongside the Rhine River, seeing a group of amazing street performers. Lows: Seeing a photo of the destruction to Cologne during WWII and being unable to imagine what it's like for your home to become war ground, waiting over half an hour for our bill at lunch (during which grandma asked two different people for it).